Clinic Synopsis: Quality literature is key to an educationally based program. Great music - both old and new – will aid students in achieving a high level of technique, style, tone development, and more. Programming quality literature for all levels of ensemble can help inspire a passion in students for the aesthetics of music. This clinic will address programming, defining quality literature and score study techniques that can assist in raising the level of our bands. Clinician Biographical Information Kate F. Margrave is the Band Director at Pine Creek High School in Colorado Springs, CO, where she teaches Marching Band, Wind Ensemble, Concert Band, Jazz Ensemble, Orchestra, Music Theory and World Drumming. Mrs. Margrave earned her Bachelor of Music Education degree from Mansfield University of PA. At Mansfield University, she participated in wind ensemble, jazz ensemble, symphony orchestra, trombone choir and brass choir, and won the Student Conductor's Competition in 2003 and 2004. In July of 2008 she received a Master’s of Music in Instrumental Conducting from the American Band College in Ashland, OR. 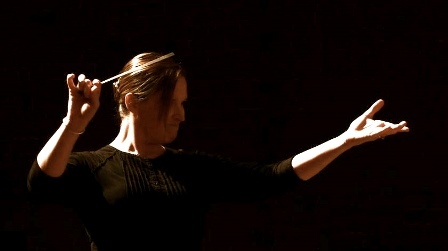 Her passion is for wind literature and emotive conducting. Kate’s favorite pastimes include score study, hiking, cycling and spending time with her wonderful husband Brian and their beagles, Cooper and Rosie.